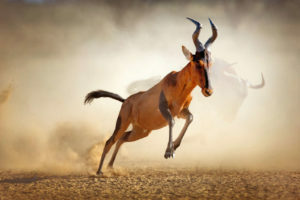 This is a 10 hunting day safari and offers many of the most requested plains game trophies hunters request including Kudu, Gemsbuck, Impala, Waterbuck, Steenbuck, Duiker and other species. This safari package enables the hunter to experience a lot of the diversity of plains game species that Africa has to offer in a spectacular setting. The hunter can expect a very high standard of all offered species in the package and excellent accommodations at the lodge. This hunting camp is one of the premier lodges in the area and offers detached chalet accommodations with air conditioning and en-suite bathrooms for a luxurious stay while on safari. This lodge also has a excellent pool and bar area for a ‘sundowner’ by an open fire after a day on foot tracking the area for game. This lodge is large enough to accommodate a family group or several friends so you can bring the whole team if you so desire!